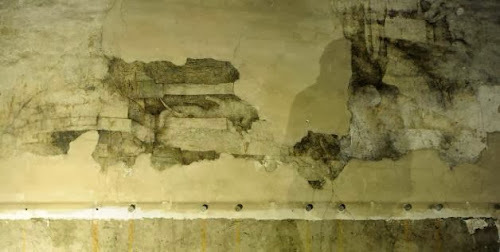 It may not seem like much yet, but when the 17 layers of paint are carefully removed from this wall with scalpels, lasers, ultrasound scaling, and special chemicals,, it will reveal the rest of a mural painted by Leonardo da Vinci. The painting has been discovered in Sforzesco Castle, the residence of the 15th c. duke of Milan, Ludovico il Moro, the same noblemen who commissioned "The Last Supper" for his family mausoleum. The fresco continues a painting on the ceiling of a wood-paneled room that was used to receive ambassadors (IMAGES HERE). When they looked up, they would have seen a garden pergola of 16 mulberry trees tied together with a golden, knotted rope. The trunk of each tree continues down the wall, and da Vinci's hand has been recognized in a depiction of sturdy roots bursting through rocks. Works by the master continue to turn up, including a painting of Madonna and Child in 2012 and a portrait of Italian noblewoman Isabella d’Este earlier this month.